THE NATIONAL TRANSPORT Authority (NTA) has said that a revised BusConnects plan will not be published until “sometime” in 2019. Consultation on the network redesign – which proposes 16 high-speed radial corridors throughout the city with 11 orbital routes – concluded in August, following a series of public meetings held by the NTA throughout the summer. Since the network redesign was launched in May 2017, concerns have been raised about the replacement of existing bus services under the plan. 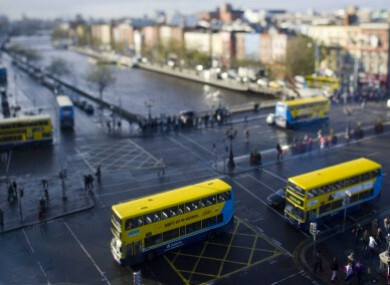 The NTA received over 30,000 submissions relating to BusConnects, NTA CEO Anne Graham has said. Key to the BusConnects plan, designed by US-based transport consultant Jarrett Walker, are interchanges – points where radial and orbital routes meet. At these points, passengers hop off one bus and onto another. If service is more frequent, however, passengers reach their destination quicker even with interchange. Last week, TheJournal.ie reported that Minister for Transport Shane Ross had asked for information on the bus network redesign three weeks after launching it. A revised plan will be made public “sometime next year”, said the NTA’s Graham. At this stage we can’t even indicate when that will be because of the level of submissions that we got. All I can say is that there will be changes to the network that we’ve proposed. Fine Gael TD Noel Rock has said that the volume of submissions received by the NTA “reflects the depth of opinion that people have”. There is a relatively quiet majority out there who aren’t necessarily on Twitter, who aren’t on social media, talking about [BusConnects]. They are worried about this. Rock says that the NTA should be able to offer a clearer timeline for the next stage of BusConnects. This whole process has been pockmarked by a lack of transparency in terms of timelines. It makes people doubt the integrity of the process. Email “New BusConnects plan won't be published until 'sometime' next year”. Feedback on “New BusConnects plan won't be published until 'sometime' next year”.